My colleagues, at AER and at selected universities, and I have found a robust relationship between two October Eurasian snow indices and the large-scale winter hemispheric circulation pattern known as the North Atlantic or Arctic Oscillation pattern (N/AO). The N/AO is more highly correlated with or explains the highest variance of winter temperatures in eastern North America, Europe and East Asia than any other single or combination of atmospheric or coupled ocean-atmosphere patterns that we know of. Therefore, if we can predict the winter N/AO (whether it will be negative or positive) that provides the best chance for a successful winter temperature forecast in North America but certainly does not guarantee it. [Of the two indices we’ve analyzed], the first and longer [more data points] index is simply the monthly mean snow cover extent (SCE) for the entire month [of October] as measured from satellites. This record dates back to at least 1972 and is available on the Rutger’s Global Snow Lab website. 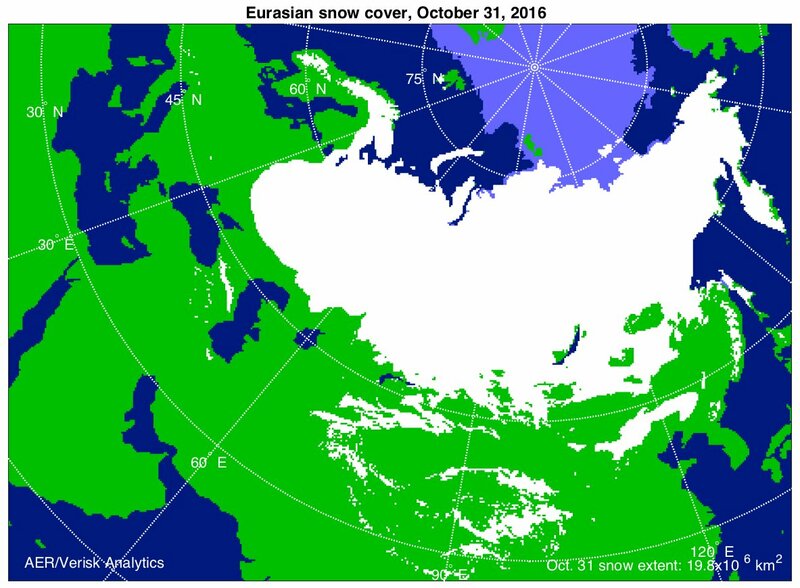 The second index that we developed last year, with the support of NSF and NOAA grants, measures the daily rate of change of Eurasian snow cover extent also during the entire month of October, which we refer to as the Snow Advance Index or SAI. There have been recent modeling studies that demonstrate that El Nino modulates the strength and position of the Aleutian Low that then favors stratospheric warmings and subsequently a negative winter N/AO that are consistent with our own research on the relationship between snow cover and stratospheric warmings. So the influence of ENSO on winter temperatures in the Mid-Atlantic and the Northeast may be greater than I acknowledge or that is represented in our seasonal forecast model. 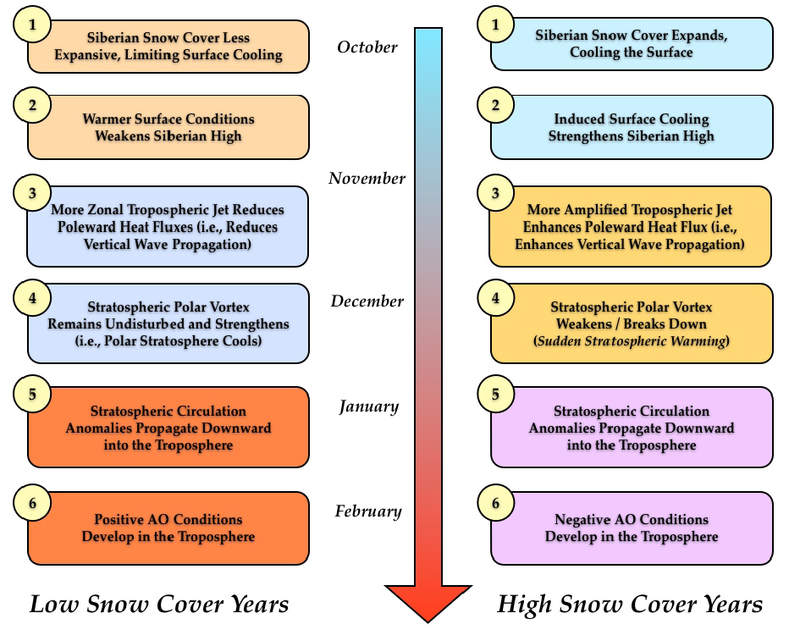 Conceptual model for how fall snow cover modifies winter circulation in both the stratosphere and the troposphere–The case for low snow cover on left; the case for extensive snow cover on right. 2. 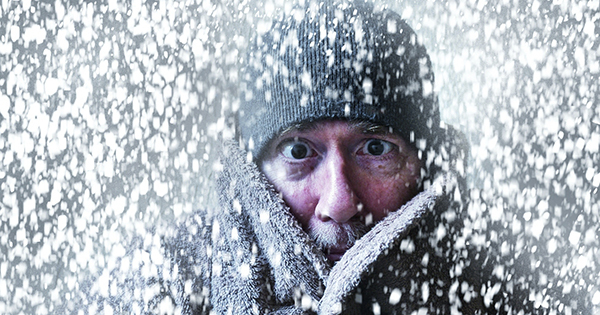 Strengthen the Siberian high and leads to below normal temperatures. 3. Snow forced diabatic cooling in proximity to high topography of Asia increases upward flux of energy in the troposphere, which is absorbed in the stratosphere. 4. Strong convergence of WAF (Wave Activity Flux) indicates higher geopotential heights. 5. A weakened polar vortex and warmer down from the stratosphere into the troposphere all the way to the surface. 6. Dynamic pathway culminates with strong negative phase of the Arctic Oscillation at the surface. Extensive 2016 Siberian snowfall led to unusually rapid recovery of Arctic sea ice following relatively low September 2016 minimum. Many important markers are currently being set indicating the atmosphere is beginning in earnest the transition from summer to winter. There are four features that I am monitoring closely over the coming weeks and months to gauge the evolving atmospheric circulation pattern and resultant weather across the NH. The fourth feature is Siberian snow cover. My, along with my colleagues and others, research has shown that extensive Siberian snow cover in the fall favors a trough across East Asia with a ridge to the west near the Urals. The atmospheric circulation pattern favors more active poleward heat flux, a weaker PV and cold temperatures across the NH. With a predicted strong negative AO in the coming weeks, snow cover is likely to advance relatively quickly heading into October. It is very early in the snow season but recent falls have been snowy across Siberia and therefore I do expect another upcoming snowy fall across Siberia. Though admittedly, recent Siberian snow cover as a predictor of winter temperatures has been mixed. Uh oh. Now where did I put away my long johns? I think it’s going to be cold this Northern winter, Ron. I can feel it in my bones…that and all the Finns, Swedes, Danes, Estonians and Russians we met this past Baltic “summer” who have told us so!